This might sound complicated to setup, but let’s look at theÂ benefits and then see how easy it is to setup log management. 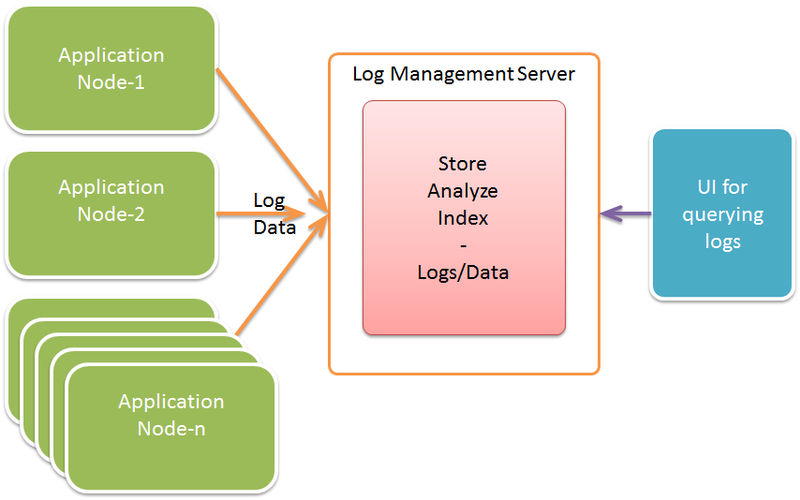 If you are troubleshooting a live application, logs will be the lifeline which will save your day. OnÂ developmentÂ environments, there are enough tools at hand which make debugging application much easier. But for an application which is live in production, logs provide key information about what is going on in the application. On the other hand too verbose logging might hamper performance of an application,but that is a separate discussion and there are tools available to control level of logging based onÂ environments. If you have applications deployed in private/public cloud, or even deployed within enterprise in aÂ clusteredÂ fashion, it will be much easier to troubleshoot and debug application if all your logs can be searched and parsed all in one place.Â InefficienciesÂ of scrolling over thousands of lines of raw data through multiple nodes and trying to connect dots would be solved by a log management system which provides a unified view of all logs and a much richer query interface. A running application has multiple user interactions and transactions running and being able to gatherÂ real timeÂ insights from these would be extremely valuable. Â Applications can be designed to log desired information about transactions and this information from logs can be analyzed and monitored inÂ real time. Just imagine if CEO of a retail company could see in real time statistics of how many shopping carts are converted in actual buys. While analytics is a huge field in itself, you got the idea of possibilities. Being able to report on errors, exceptions and crashes in real time can lead to actions which reduce downtime and much proactive response to issues in a live application. Alerts can be setup based on severity level and actions can be taken accordingly. While every product and service offers different flavours of features, we consolidate here some features you should look out for. Being able to filter on random text, or being able to click on strings from the result shown on UI makes navigating and finding relevant logs much easier and quicker. Also a regular expression library like grok for example shipped with LogStash helps using regular expressions a easier job. A good log management system should be able to hook to multiple systems like email, websockets for delivering information. That increases reach of the system and it’s usefulness. Last but not the least, having a API of the log management system exposed can greatly increase adoption and extensibility of platform in some cases. Which type of applications you have and do you have sufficient hooks available to plug into log management system? For example if you would like Android apps to log data to log management server, do you have a lightweight library supporting the same? Does the language in which applications are developed has easier ways to communicate to a log management server? 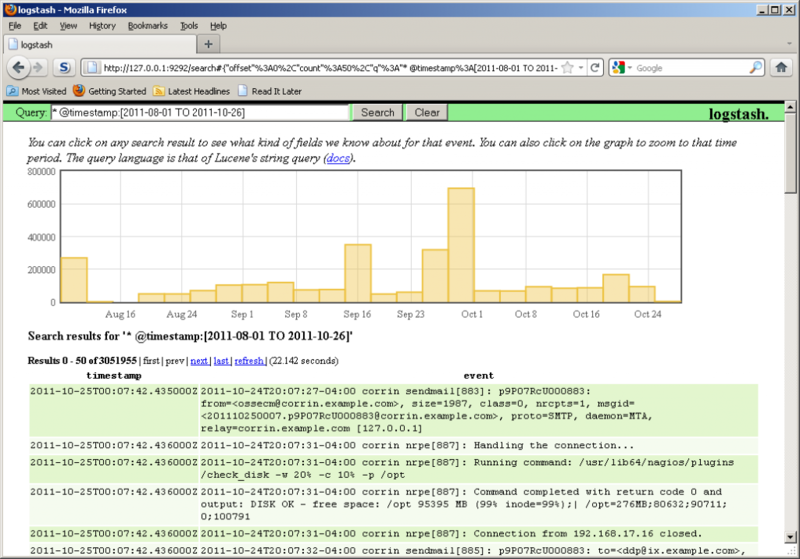 For example log4j has SysLogAppender which can talk to Syslog which in turn can talk to log management system. If your application is hosted on a PaaS platform, can you integrate the platform with your own or hosted log management servers? If you are planning to set up your own log management system, either within yourÂ enterpriseÂ or on hosted environments you have quite a few choices. If your organization has budgets to buy support and want enterprise grade system without a team to maintain the system inhouse, then Splunk is probably a good fit. If you have a team inhouse which is ready to look after the system and prefers a DIY approach, then you can choose from a set of tools for each specific purpose. Log storage and indexing can be done in MongoDB, ElasticSearch to name a few. Tools like LogStash, Kibana, Graphite, Greylog2 offer different features and you can mix and match to suit your needs. If you want to add Log Management as a service to your existing apps in cloud, you have choices like Loggly, papertrail, logentriesÂ among the main players. While we won’t be discussing them in detail in this post, each one offers it’s unique flavors of log management strategy. You can decide not to give enough importance to logging in your applications but theÂ benefitsÂ of logging and a good log management system are far reaching. In a world where horizontally scaled environments are the norm and cloud is being adopted day by day, a good log management system is a necessity but can prove to be aÂ differentiator. Â Organizations have already started reapingÂ benefitsÂ of log management system from production debugging to analytics. Has your company started the journey yet? Let us know your thoughts.